This is maybe the last time to post a comment for this blog. I knew that KONICA MINOLTA decided to stop camera business yesterday. I was a little sad because my digital camera had been made by MINOLTA a little before it had consolidated with KONICA. Also, camera manufacturers will be only Nikon and Canon when KONICA MINOLTA stops the business…. I think that choices in everything decrease recently. I do not want many choices because I cannot decide, but fewer ones are boring. If I buy a new camera, I have to choose one from only Nikon, Canon, Sony, Panasonic and Olympus. (Olympus already decreased camera business greatly.) They except Nikon and Canon do much business, so they are different from camera manufacturers. However, the manufacturers gradually seem to be nudged aside by the other companies gathering momentum. I hope that they will play catch-up. In Japan, people of 20 and over are regarded as adults. When people become adults, they are celebrated and municipalities hold the ceremonies for them around the second Monday January, Coming of Age Day. I am 19 years old, but I am in the same grade in schools as 20-year-old people because Japanese law of schooling says that people who are born on 2 April to 1 April of next year are in the same grade. The year when people go to Coming of Age ceremonies depends on the grade, so the ceremony came to me as well as 20-year-olds on 9 this month. Women usually wear long-sleeved kimonos and men are suits or hakamas for the ceremonies. 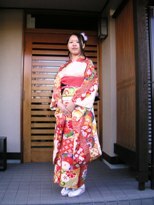 I also wore my mother’s kimono and went to the ceremony on that day. My mother said that a kimono made me feel uneasy and I was not able to eat anything. Therefore, I was ready for them, but they were actually not problems for me. There were only two small others. One was that I was not able to walk at the same speed as usual. The other was that I had stomachaches when I laughed. I felt comfortable in the kimono, so I did not take off it after I came home. However, my family asked me why I did not do that so many times. It was a little annoying…. I thought that I had liked kimonos and I want to wear them for my daily life in the future. I would go to school in the kimono next day of Coming of Age ceremony if I could. Now, I wonder whether I will wear it or a hakama for my graduation ceremony. Recently, I have so many unwanted calls!! On Wednesday, someone called me about 15 times for six hours. I do not know who the person is and I kept ignoring the calls. I searched the phone number using the database of unwanted calls, but there was no information. The calls made me uncomfortable, so I block them. Then, I searched the number on the internet again. I found that a broiled meat store in Tokyo called me. However, there are some ways to pretend to be other people and use their phone numbers. Therefore, I switched on the answering machine. Yesterday, there was a message on it and I checked it. The broiled meat store in Tokyo actually called me. According to the message, the store apologized to a customer because it accepted the customer’s reservation by mistake. I was surprised at it and thought it was better to make sure of reservations. I like to take personality tests and so on. Recently, I took IQ test of a TV program because if I took it, I could know suitable jobs for me. People who took the test were divided to four types and the jobs were based on those types. The test was composed of six sections of questions and one question. Four sections of six related to front and back places of right brain and those of left brain. Two of them whose correct answers were more than the other two decided the types. I was a little sad at the result of the test because the jobs were different from those that I hoped to get. My best friend told me that her suitable jobs and her hope were the same, so I envied her. At the same time, I was not satisfied with my result. The biggest reason was that two of four sections had only one correct answer more than the other two. Also, I thought that my type would change if something was different. I told one of my friends about it and she said that I had many possibilities. I appreciated her and I want to think positively like her. Do you have a dream? This year will finish soon and I have to think about my future. I have my dream to get a certain job. However, if I get the job, my preparation for it will starts next year and my job hunting will the year after next at the earliest. People usually start their job hunting around September in the third year. Therefore, the lateness makes me worry and I wonder whether I can realize my dream. I know that if I really want to get the job, I cannot help making an effort to achieve it without worry or hesitation though. A fortunetelling says that “if you ask the new moon what your calling is, you will receive the answer before the full moon.” My dream may change, but I want to decide my future after the full moon because I believe the fortunetelling. I had written that a creative urge had not sprung up in me since last year on 28 October, but I suddenly wanted to make a piece of jewelry before a week. Therefore, I made a bracelet and felt like showing it to my best friend. I took the picture and sent her e-mail with it. She told me that it was great and she wanted me to make the same one for her. I was surprised at her words, but I was willing to make it. Next day, I sent her the bracelet with a letter. When it arrived, she said that she had liked it and I was glad to hear she said so. The bracelets are the second same things that we have. The first ones are necklaces which we bought together. I tend to think that the same things that people have are what they buy at shops. Accordingly, I a little wonder that our second same things are my own works. However, I like the bracelet and I wear it almost everyday now. P.S. These colors are based on the bracelet. I am a Japanese student who is majoring in English. When I don't have things to do, I often think idly something. I like to sun myself in spring.